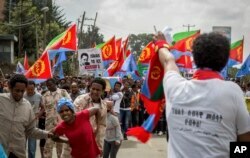 FILE - Eritrean exiles rally in front of the African Union headquarters, responding to a U.N. report highlighting human rights violations in Eritrea, in Addis Ababa, Ethiopia, June 26, 2015. In signing a historic peace deal with Ethiopia and cooperation agreements with Djibouti and Somalia earlier this year, long-isolated Eritrea gained fresh opportunities to re-emerge on the world stage. Eritrea, however, now faces renewed pressure from human rights groups, which want the government to release or account for thousands of political prisoners it is believed to be holding, some of whom have been held incommunicado for 17 years. Human Rights Watch said this month that the recent arrest of Eritrea’s former finance minister, Berhane Abrehe, was a troubling sign that the government is continuing to clamp down on critics. Ciham Ali Abdu is among those believed to be in detention. In December 2012, Ciham attempted to cross Eritrea’s border into Sudan. Without a required exit visa, Ciham, then 15, had violated Eritrean law. She was caught and detained. Six years later, her whereabouts and health remain unknown. Ciham is not unlike many young Eritreans who have fled or attempted to flee the country to seek economic opportunities or escape oppression. Hundreds of thousands of Eritrean refugees have scattered around the world, according to the United Nations. But Ciham is also a U.S. citizen. She was born in Los Angeles. Her father, Eritrea’s former minister of information, fell out with the country’s authoritarian leader, Isaias Afwerki, in 2012, putting Ciham’s family at risk and prompting them to leave. FILE - Eritrean exiles, some holding Eritrean flags and some dressed as Eritrean military members, simulating beatings and torture, left, rally outside the African Union headquarters, in Addis Ababa, Ethiopia, June 23, 2016. Releasing Americans imprisoned overseas has been a priority for President Donald Trump’s administration. It is not clear whether the U.S. government has taken steps to push for Ciham’s release. In an email response to questions from VOA, a State Department spokesperson said the government was aware of reports of Ciham’s detention, but did not confirm whether the United States had determined that Ciham is imprisoned, or if specific efforts had been made to secure her release. The spokesperson said the U.S. remains cautious about its bilateral ties with Eritrea, due, in part, to concerns about governance and human rights violations. The Eritrean government did not respond to multiple requests from VOA to comment on Ciham’s case or HRW’s report. HRW’s Burnett told VOA it’s not only the United States’ responsibility to bring about change in Eritrea. The group is urging countries in the region to put diplomatic pressure on the Eritrean government. “It’s critical that countries in the region and the donor countries who are interested in working with Eritrea begin to raise this issue of releasing political prisoners so that free expression can come to Eritrea,” Burnett said. The U.S. is optimistic about the positive role Eritrea can play in further strengthening regional peace. Eritrea has brokered peace between other regional players, resisted violent extremism and can draw on a history of self-reliance to emerge as a regional leader, the State Department spokesperson told VOA. That potential has not yet changed things for the political prisoners, activists and journalists who remain detained. In a video advocating for the release of prisoners, HRW interviewed family members, including some who have not seen loved ones for 17 years. “They often don’t know where the person is being held or under what conditions. But also the toll that this has taken on their families, to have a loved one absolutely vanish like that into detention for such a long period of time, and to have no idea where the person is — it’s taken a huge toll,” Burnett said. “Parents have lost children, and children have lost parents. And it’s a situation which simply must end,” she added.